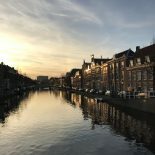 It is summer in The Hague: my study buddies are traveling, my family is far away, only a very small group of friends is still here with me – so what can we do in the summery weather of Holland’s west coast? My personal favorite place to be in the afternoon of a hot day must be the beach. I am lucky enough to live in Scheveningen and thus a 10 min bike ride later I´ll be lying on my beach towel, watching people, dogs, horses and the usual hustle and bustle at the beach. Of course I´ll bring my sunscreen, because painful experience has taught me that the sun is still very strong in the afternoons and evenings 😉 If the temperature gets to hot, despite the cool wind that is usually blowing along the coast here, I will have a dip into the sea (last week: 19°C). Insider´s tip: I would also recommend staying until the sun goes down, as the sunsets at Scheveningen Beach can be breath taking! Another place to go to on hot days is a lovely park. The Hague has quite a few green spaces to offer: The big and quite central Zuiderpark, also Zorgvliet and Scheveningse Bosjes are amazing parks – less busy and crowded than Zuiderpark – close to the beach. As a park in town, I can recommend the Paleistuin – directly behind the Noordeinde Palace. Here you can relax on the grass, admire the flowers or sit at the water installation. These 4 recommendations are bigger parks you can find on maps as well. However, when you are alert and observant, you will find gezellig and inviting places to relax in almost every neighborhood of The Hague. A little advice: Make sure that you are allowed to grill in the park, if you are planning to have a BBQ. We are usually going to Zuiderpark for BBQs and there are even trash bins for ash and other waste from barbecuing. When the weather is slightly cooler and you feel like some activity would be good for you: a bike tour to the beach, or to a suburb of The Hague or simply through the city are perfect alternatives for sunny summer days. This entry was posted on August 2, 2014 by in Frederike, Living in Holland and tagged beach, Ideas, Parks, summer, Summer2014, The Hague.